I arose at five this morning and Swiffer®ed my glass-block shower walls. Stroke of genius. I don’t know what possessed me to arise at five and Swiffer®, but that’s what I did. I felt so self-righteous that I proceeded to Swiffer® the floor of my 30-square-foot shower. I don’t recall ever having mopped a shower floor, much less Swiffer®ed one. You can’t imagine the power you feel when you Swiffer® your shower. Thus invigorated, I decided to clean the rest of my bathroom. I handed him pictures cut out of magazines. A clawfoot bathtub and a pedestal sink. Walls a color that no one has ever named, but are a cross between watermelon and terra cotta (I call it meloncotta). Purple towels hanging from hooks on the walls; no towel rods. Suntube. Hidey-holes. A glass-block o-p-e-n European-style shower: clunky glass walls that don’t go to the ceiling; no door or curtain. Big as a ballroom. Mr. Carson from Downton Abbey could waltz in it. Antique furniture instead of cabinets. Because I live in the attic, my sloping ceilings are already funky. I looked up funky in an online etymological dictionary. First known use of funky: 1620’s. Definition: having an offensive odor. This was not the funky I was going for. Used in French from the Latin fumigare. Smoky smell. Evolved into meaning musty smell, especially as associated with cheese. Not what you want when you remodel your bathroom. Not at all what I had in mind. But in the 1900s, funky began to have a positive meaning associated with jazz: strong, earthy, deeply felt. Earthy. That’s going the right direction. I wanted my bathroom to proclaim me as earthy. I wanted it to evoke strong, deeply-felt earthy emotions. By the 1960’s, funky meant fine, stylish, and excellent. My definition was building. Stylish and earthy. The Oxford Dictionary defined funky as modern and stylish in an unconventional or striking way. People from Oxford should know. Merriam-Webster added: odd or quaint in appearance or feeling; unconventionally stylish. That completed my ideal bathroom plan: A fine, odd, quaint, earthy, unconventionally stylish place. A Deeply Felt retreat where I could take bubble baths and feel free and unenclosed by shower walls. So the New Year will be here in a few hours, and I will have a freshly-scrubbed bathroom. I commend New Year’s Eve bathroom cleaning to you. Clean your bathroom. Swiffer® your shower. Then get funky and take a bubble bath. Unless you think that’s hinky, of course. I am an omnivore. I wish I were not carnivorous, but I am. I’m not proud of it. But there you have it. I tried being a vegetarian twice. The first time was thirty years ago. After four months, I was invited to the home of a couple for dinner. They served steak. They didn’t know I was a vegetarian, and I hadn’t thought to tell them. I guess I wasn’t a very good vegetarian because I ate the steak. The effect? Like I’d taken a dose of heroin. I was hooked again. The second time I tried being a vegetarian was in 2003. Husband Don agreed with me (he doesn’t like beef, and prefers sweets or chips’n’salsa to most anything), and we set upon a year of being vegetarians. Then I got sick. I went to my doctor. She sent me to an O.D. neurologist, a Dr. V. Radkar. He spent fifteen minutes with me and didn’t order any tests. He patted me paternally on the knee and said, “You’ll be fine. You’re just a busy little housewife with a lot on your plate.” I swear on my mother’s grave that he said that. I wanted to kick him. I got sicker and sicker, so after filling my bedroom and wardrobe with pink things for three months (I’d read that seeing pink produced important neurotransmitters), I decided that maybe my brain needed amino acids found in meat. After a year as a vegetarian, I ate a big plate of liver and onions. Then a steak. And the vegetarian life style was only a memory. I wish I weren’t a carnivore. I wish I didn’t eat the flesh of dead animals. But I am, and I do. So this morning I started thinking about the word carnivore, and I came up with the following definitions. Clandivore- one who eats in secret. Probably on a diet, but cheats. I added: But sometimes when he finishes his tidy eating, he licks his plate clean and then eats his napkin. Commavore- a high school English teacher who slashes through inappropriate soft stops on students’ papers. The Commavore is the sworn enemy of the class of student known as the Commakazi. Happy New Year, my friends. You know who you are. I sat near a father and his three children at McDonald’s last October. The boys were maybe eight and ten. The little girl, perhaps five. The children ate quietly. The young father, who wore a ball cap pulled down, hunkered over his cell phone texting or playing games. The entire time. The little girl repeatedly tried to engage her daddy, but he didn’t even look up. The little boys didn’t even try. I wanted to shake that young man and say, “Grow up! Be a father! Put your toy away and talk with your children!” But I didn’t. Today I went to HFC for lunch: Higdon Ferry Café. Tasty, inexpensive, country fare. Local color. When a young father wearing a necktie came in with his little girl, I perked up. She was four or five. I thought, Watching them talk and play together during their meal will be delicious. But as soon as they sat down, instead of playing with his little girl, the man grabbed his cell phone and started playing with it. When the waitress came, the child ordered. I couldn’t hear what she ordered, but her father said, “No, she can’t have that.” Then he ordered for her and himself, not taking his eyes off his toy. I thought, He probably doesn’t have enough money to pay for what she wanted. He ordered what he could afford. He’ll put down his phone in a minute and talk to her. Ha. Then she said something and he jerked her up and pulled his right arm back as though he were going to backhand her. I gasped. He neither looked at me nor spoke. His lips formed a thin, white line, but he took the toy. He realized that someone- maybe everyone- had been watching him. This afternoon, I have tried to see the world through that young father’s eyes. What heartache could cause a daddy to ignore and then threaten his little girl so he could play with his cell phone? Had he just lost his job? His fortune? His love? But I do know the prayer. Father God, turn men with children into daddies. Make them patient. Make them gentle. Make them kind. And teach them that their children are infinitely more important than fancy phones. Amen. Until we moved to Arkansas, I only seen a red fox once. He came through the back garden of the English cottage where I was staying. He was not the gorgeous fellow of fairy tales. His hips, backbone, and ribs protruded. Most of his hair had fallen out. I tossed and turned all night. I began studying about red foxes. I learned that December is the month when young females come into estrus and young males try to establish a territory where they can start a family. I learned that red foxes live in Arkansas. But I was living in a city in the Texas desert where no red fox had ever trod. The first morning that I saw a red fox from my bedroom window here at my retirement home in Arkansas, I raced down the stairs to tell Husband Don. Yes, I was sure. A big, beautiful red fox. My big red fox trotted by the house every morning about seven. He stopped in the commons area behind the creek that borders our yard. In the summer, I couldn’t see him through the trees, but when the leaves fell, I could watch him from my bedroom in the attic. He would stand in the clearing and peer north and south, nose testing the wind. Satisfied, he would head west. The stuff of fairy tales. Then, late last summer, I saw him lying in the middle of the road. A turkey vulture was pulling his already-ravaged body into the gutter where it could feast safely. It’s the circle of life, I said to myself. It’s the circle of life. But I grieved for weeks. Then, yesterday morning, Old Dog Callie woke me up when she leapt from my bed and began to bark and scratch at my bedroom windowsill. Baby Dog Woodrow began barking and running in circles to help his sister, although he had no idea why she was excited. I looked out the window, but because of the quilt of red, gold, and brown leaves covering the ground, I couldn’t see anything. Callie insisted that something was happening. I let my focus go hazy and stayed alert for movement. Then I saw it. In the trees, north of where Old Red Fox used to test the air, stood a young red fox. He sniffed the air to the east and north for a minute and then headed west. My heart thundered. “It’s okay, Callie,” I said. “He’s supposed to be here.” Yes, he’s supposed to be here. I sat up on the side of the bed and thought, He’s the son of Old Red Fox. He’s establishing his territory, filling the vacancy left by his father. He’s looking for a vixen. To mate. To start a family. It’s the Circle of Life. The Circle of Life. Old Dog Callie and Baby Dog Woodrow hopped up on the bed next to me. I wrapped my arms around them both and hugged them close. Last week I took my car to Little Rock for its 12,000 mile oil change. The dealership sits on the east side of six lanes full of hurtling traffic. A supermarket sits on the west side. Although rain was falling intermittently, I was determined to walk to the supermarket to eat lunch while I waited because I like their fried chicken and tender green beans. I zipped up my raggedy bum-around jacket, took a deep breath, and then barreled into the traffic. I dodged three cars to get through the first three lanes to the median, but I made it. I scrabbled over the stickery bushes on the median. No mean feat, that. The second three lanes were easy after the first three and the median, and I reached the parking lot safely. The rain started pouring, so I ran the last twenty yards to the supermarket’s doorway. By the time I got inside, I was a mess: wet, cold, bedraggled. My bum-around coat was neither waterproof nor warm enough. My white hair was plastered down on my head. I suppose I looked like I didn’t know where my next meal was coming from. A woman I had not seen before waited on me. She had the leathery skin of someone who had worked outdoors all her life, or perhaps had smoked for years, or drank too much. She didn’t have any teeth. She’s had a hard life, I thought. She looks like she doesn’t know where her next meal is coming from. I wish I could help her. She dug through the chicken for a thigh and a leg. “Sides?” she asked. “Corn. And green beans.” She ladled me up a scoop of buttery corn. She raised her head and studied me for a long moment. Then she served me a giant helping of green beans. She paused, then dipped her spoon in the beans again and added a second big helping. She looked up, and at the moment our eyes met, I read her thoughts. She’s had a hard life, she thought. She looks like she doesn’t know where her next meal is coming from. I can do this to help her. So that day, two old women touched each other’s hearts. She and I saw in each other a needy stranger. I knew I could do nothing for her, but she knew she could do something for me. She ladled me a mountain of tender green beans. And the gift of kindness to a stranger. For a week, I lay in bed at night and dreamed about preparing my first dish for my daddy. Mother was a gourmet cook: people begged to be invited to parties where she served her Greek-style leg of lamb, the mouthwatering Onion Cheese Pie that she created, Cherries Jubilee. When she gave me Betty Crocker’s Cookbook for Boys and Girls for Christmas, I was delighted. At the tender age of eight, I was being invited to become a princess in this realm that my mother ruled as queen. She said that the following Friday night, I would be allowed to prepare a dish from the book. A salad, perhaps, or a vegetable. I decided that I would prepare a salad that would please my daddy. (You might have to be a southern girl to understand this.) A vegetable would be lost on the plate beside the starch, bread, and entree. A salad would be a first course that would be the center of attention. And it was. Mother announced to Daddy that I was going to prepare the salad course for him on Friday night. My brother, who was three years older, would be at a party that evening, so this would be a special night for me. Daddy asked me what I was going to prepare. I said, “It’s a surprise.” And it was. 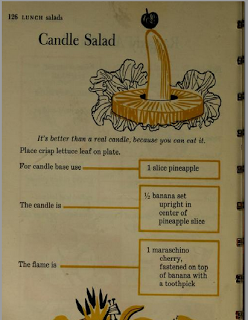 The recipe was Candle Salad. I set the table beautifully and hid the salads in the refrigerator. When Daddy and Mother were seated and grace was said, I went to the refrigerator and with great dignity carried Daddy’s salad to the table and set it before him. Then I brought Mother's. Then mine. By the time I arrived at the table with my salad, tears were running down Daddy’s cheeks. He was biting his lower lip. He began to shake. Then he started to roar with laughter. “Daddy! Stop that!” hissed Mother. But he couldn’t. I was devastated. My daddy was laughing at my salad. “What did I do wrong?” I cried, jumping up from my seat wanting to correct my mistake. “Nothing!” he shouted, trying to control himself. “Absolutely nothing! It’s the best damn salad I’ve ever had in my whole damn life!” he cried. “Then why are you laughing at it?” I whimpered. “Honey, I’m not laughing at the salad,” he said trying to regain control of himself. Then he snorted and laughed harder. In spite of herself, Mother started laughing, too. I was not laughing. I did not figure out until years later what was so funny. This is the recipe from the book. You might want to try it yourself. Or not.